Railpictures.ca - Dave Burroughs Photo: More from the heydays on the CASO in Southern Ontario. A few traces of snow signify that winter has not completely gone yet. A pair of Burlington units are in the consist and one is the 941, somewhat captive in Canada as per Bruce Mercer. I find it interesting that many of my shots on the CASO, be it NYC or C&O, have a GE and a GM unit. 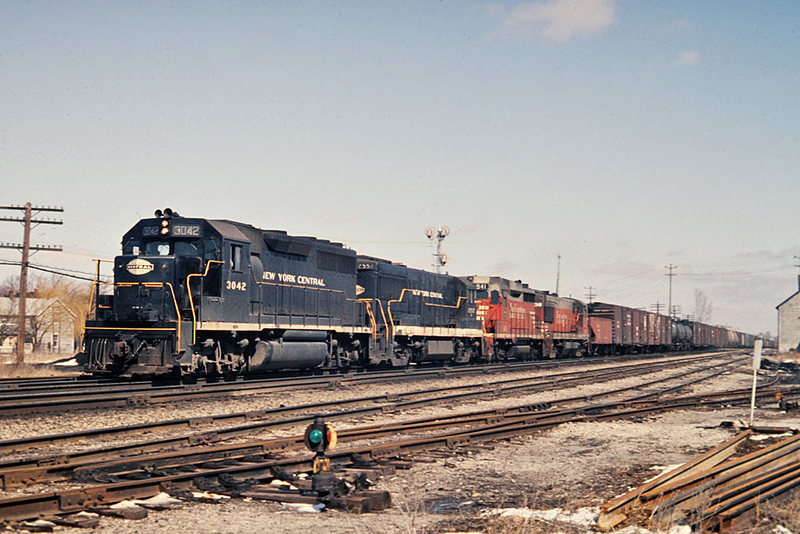 Here we have a GM GP40 3042 and GE U25B 2557 as the GM/GE combo. | Railpictures.ca – Canadian Railway Photography – photographie ferroviaire Canadienne. Caption: More from the heydays on the CASO in Southern Ontario. A few traces of snow signify that winter has not completely gone yet. A pair of Burlington units are in the consist and one is the 941, somewhat captive in Canada as per Bruce Mercer. I find it interesting that many of my shots on the CASO, be it NYC or C&O, have a GE and a GM unit. Here we have a GM GP40 3042 and GE U25B 2557 as the GM/GE combo. Another beauty “from the day”, thanks Dave. Good angle showing the coop elevator and back tracks, one of which ( furthest to the right of your image) went as far as Main Street/Hwy 6, once upon a time.